Why play Russian roulette with your child's life? ANN COOTE, 40, is co-founder of the pressure group JABS (Justice, Awareness, Basic Support) which represents 800 families who say their children are vaccine-damaged. Anns 10-year-old daughter Rachel suffers severe epilepsy as a result of MMR. 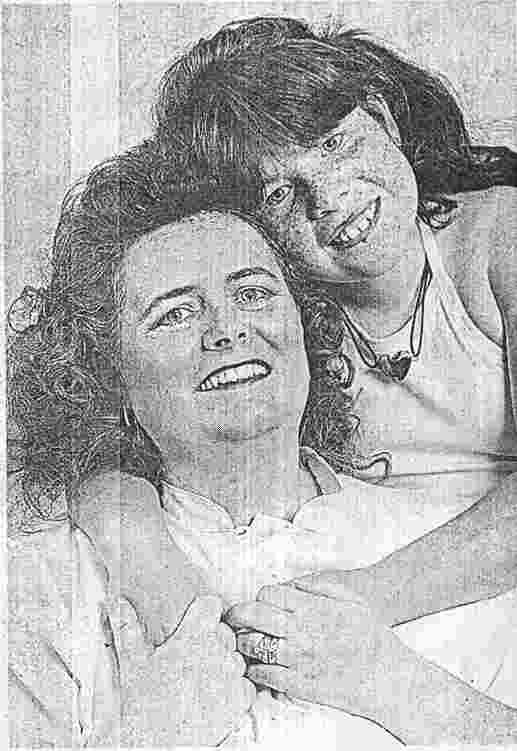 RACHEL was one of the first children to have the MMR vaccination,  she was 18 months old. Even then I was wary of it. When I took Rachel to the clinic in February 1989, I was told by the nurses that MMR had been used in America and there were no possible side-effects. In fact Rachel was given a form of MMR called Pluserix, which was never used in America and was withdrawn in the UK in 1992 because it was linked with cases of mumps-meningitis. The following day Rachel was very irritable  not her usual loveable self. My GP advised plenty of fluids and paracetamol to bring the temperature down. But she didnt get better. Her temperature was 104. She was going off her food. Her face started to swell up and she gave out frightening, high-pitched screams. On the ninth day I took her back to the GP, who said she had all the symptoms of meningitis without the stiff neck. He gave .me antibiotics and told me to keep a close eye on her. I took her home, gave her the pills and she fell asleep on my knee. Then she stopped breathing. I was terrified. The diagnosis was that she had had a convulsion, probably related to MMR. By the next day she was covered from head to toe in a measles-like rash. I said she couldnt have measles because she had had MMR. I was told it was the vaccination coming through. It got worse. A nurse asked me if Rachel could talk. I said of -course she could. But by the time we got her out of hospital she had lost her speech..
She went from being a happy-go-lucky girl to a child who cried all night, was silent in the day, and confused about who her parents and brothers were. Three months after she had MMR she developed mumps, so she actually had two of the three diseases she was vaccinated against. She wasnt Rachel any more. She couldnt talk. Shed gone back into nappies. She would fall over for no reason. We found out that these were epileptic seizures. She started having 20-30 a day. Her whole life was turned around. She was put on anti-epileptic drugs to try to control the fits. At five they said she would never read or write. So she goes to a special school. When she was younger you couldnt take her to a supermarket because she would run amok, pulling things off the shelves. Now she is 10, but she has the mind of a four-and-a-half-year-old. She is just beginning to read and write  something they never thought shed do. She now has so many fits I couldnt count them. Nights are worst. She wakes four or five times screaming like a baby. Although she is crying for mummy, she doesnt know who I am for several minutes. As if all this wasnt sapping enough, we have had a dreadfully difficult time fighting for compensation. You have to prove to the Department of Health that your child is vaccine-damaged and is more than 80 per cent disabled as a result. I know parents who have. been turned down because they say the child is 79.5 per cent disabled. Even though Rachel was. assessed at 80 per cent, we are still waiting for compensation. The Department of Health deny that MMR caused the long-term effects. They accepted that the first convulsion was caused by MMR, but because it took 12 months for her to be diagnosed as. epileptic, they said the gap was too long. We will fight on. Vaccinations were developed for the best reasons. But parents now feel, they are playing some form of Russian roulette and they dont want that. They want protection without risk. We believe three-in-one vaccinations should be suspended until more is known about MMR. Parents should be able to make an informed decision. Our organisation represents more than 400 children whose parents regret ever having allowed them to have MMR. They suffer from serious complaints such as autism, Crohns disease, arthritis, diabetes, severe learning disabilities and epilepsy. Unless there are more tests then we will end up with lots more Rachels.